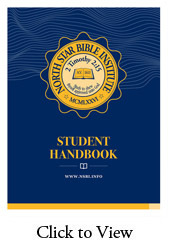 The NSBI Servant’s Diploma is designed to prepare local church members for service as ministers and leaders in the local church. The curriculum is specifically chosen to give the student a wide range of experience and education in the most important subjects that we offer. The Bachelor of Arts Degree adds three General Education courses in English, Psychology and History. To pursue a post graduate degree at an accredited college or university, these courses or others like them, will be required. Most institutions will “backfill” these courses at much greater expense than NSBI. Colleges and universities are looking for approximately 120 undergraduate credit hours to move on to post graduate work including General Education coursework. The Graduate of Theology and the Bachelor of Divinity Degrees are offered by NSBI through its extensive program of biblical and practical studies. The Graduate of Theology degree, usually completed in four years (and the degree for which the curriculum was originally designed), demands a completion of 100 credit hours, or an average of about eleven to twelve credit hours of classes per semester. The Bachelor of Divinity degree requires completion of 110 credit hours, but demands more required courses than the Graduate of Theology. Specific courses required for the degrees are taken in conjunction with various electives. 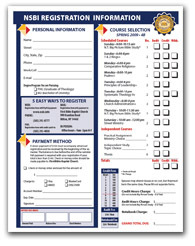 Courses required for graduation are so noted in the curriculum schedules in this catalog and are subject to change at the Director’s discretion. Depending upon the semester, there are a number of hours that are required classes, and a full-time student may fill the remainder of his or her schedule in any given semester with those electives.